1 To review the office market in Bakewell in the light of pressures for change from office to residential in town centre sites. Download "1 To review the office market in Bakewell in the light of pressures for change from office to residential in town centre sites." 1 Page 1 5. THE BAKEWELL OFFICE MARKET (A610611/BT) Proposal 1 To review the office market in Bakewell in the light of pressures for change from office to residential in town centre sites. Within the context of prevailing policies, to inform decision making on office development within the town in the light of the following applications. To help inform the formulation of the relevant part of the Local Development Framework. RECOMMENDATION: 2 That the report be noted Policy/Legal Background 3 Development Plan policies were written to fulfil national park purposes. There is recognition that the national park is a limited and precious resource, which is under pressure for development because of its accessibility and attractiveness. Consequently the amount of new development permitted, particularly residential will be limited and mainly needs based. 4 Policies are generic and this is emphasised in paragraph 1.18 of the Structure Plan, which states that policies are applied in sequence: firstly the general strategic policies (GS1, GS2) then the spatial conservation policies (C1, 2, C3) then all the detailed policies relevant to the case. Individual policies must not be selected in isolation. 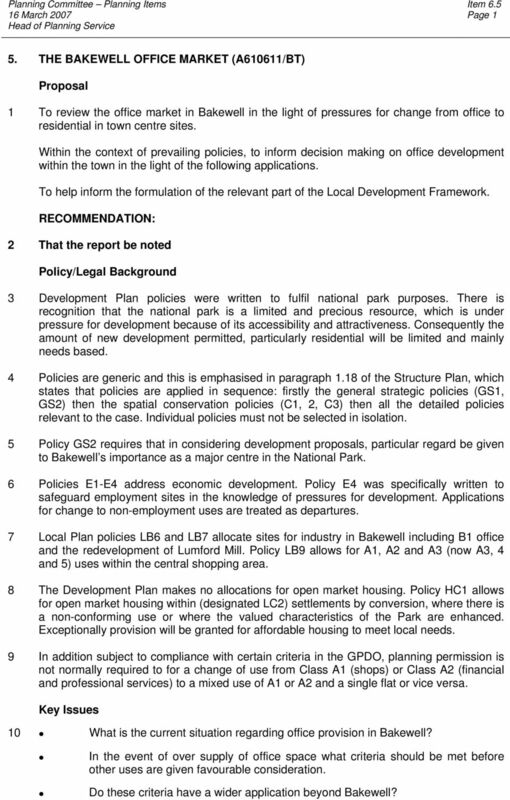 5 Policy GS2 requires that in considering development proposals, particular regard be given to Bakewell s importance as a major centre in the National Park. 6 Policies E1-E4 address economic development. Policy E4 was specifically written to safeguard employment sites in the knowledge of pressures for development. Applications for change to non-employment uses are treated as departures. 7 Local Plan policies LB6 and LB7 allocate sites for industry in Bakewell including B1 office and the redevelopment of Lumford Mill. Policy LB9 allows for A1, A2 and A3 (now A3, 4 and 5) uses within the central shopping area. 8 The Development Plan makes no allocations for open market housing. Policy HC1 allows for open market housing within (designated LC2) settlements by conversion, where there is a non-conforming use or where the valued characteristics of the Park are enhanced. Exceptionally provision will be granted for affordable housing to meet local needs. 9 In addition subject to compliance with certain criteria in the GPDO, planning permission is not normally required to for a change of use from Class A1 (shops) or Class A2 (financial and professional services) to a mixed use of A1 or A2 and a single flat or vice versa. 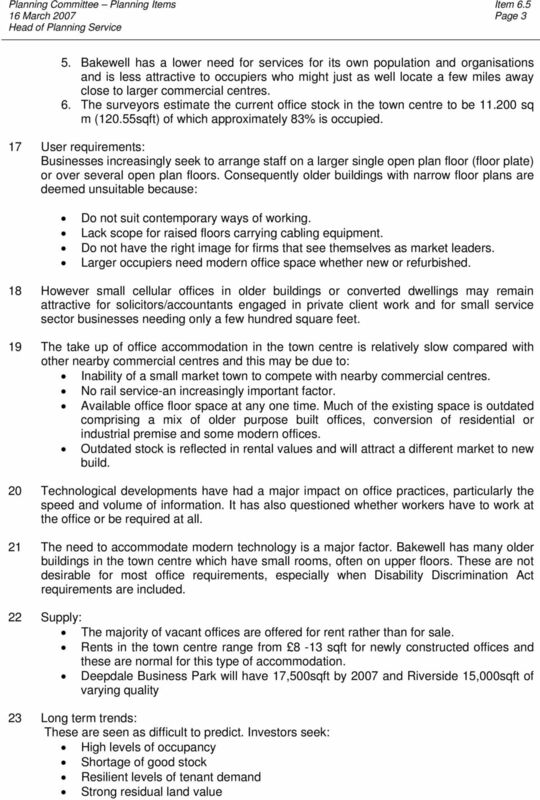 Key Issues 10 What is the current situation regarding office provision in Bakewell? In the event of over supply of office space what criteria should be met before other uses are given favourable consideration. Do these criteria have a wider application beyond Bakewell? 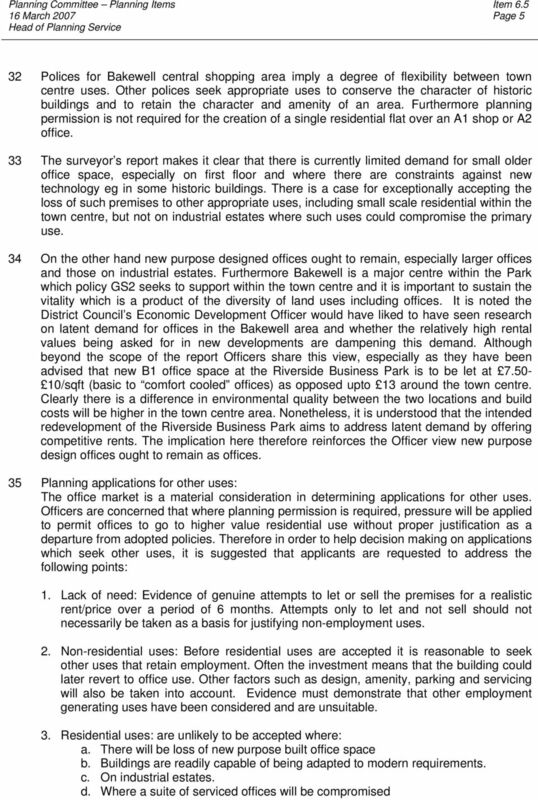 2 Page 2 Background APPENDIX 11 In recent years there have be several applications to convert office space in Bakewell to residential. This is in part because Bakewell is such a desirable place to live, and in the virtual absence of new open market housing, commercial properties in and around the town centre are under pressure for residential use. Adopted polices safeguard business land and buildings, in order to prevent unnecessary demand for new employment land in the national park where suitable sites are limited. To help inform decision-making, a study of the office market was commissioned in As circumstances may have changed, another report was recently commissioned from property surveyors who have specialist knowledge in this area. 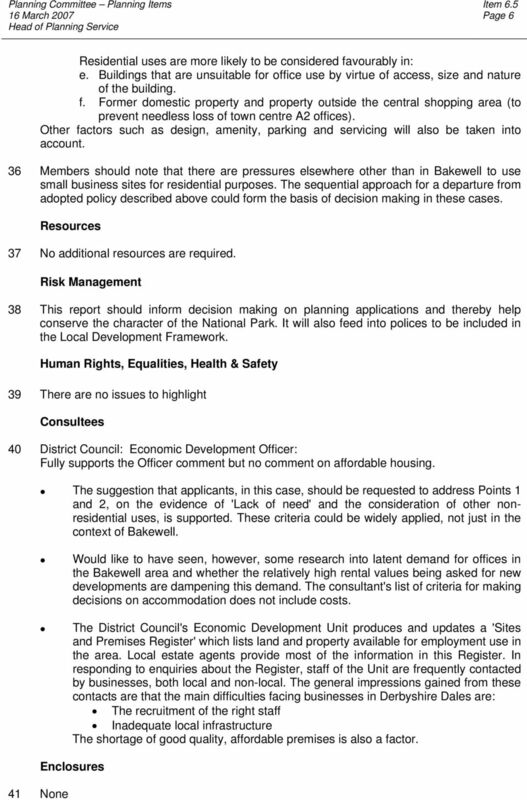 The findings of these reports are discussed below Report Early in 2003 the Authority commissioned a local business and property surveyor to give an opinion on rental office accommodation within the Bakewell area. He advised that first and second floor accommodation within the town, without parking, generally above retail outlets, would let at that time between 9-11 per square foot. However, more up market, quality accommodation with car parking such as Rutland Works should have a rental value of around 13 per square foot. The rental figure includes a 50p per square foot premium where offices are air-conditioned. 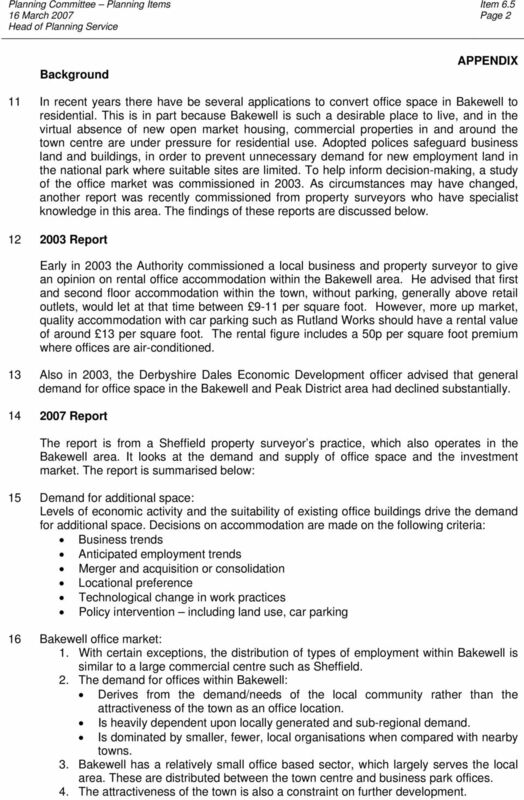 13 Also in 2003, the Derbyshire Dales Economic Development officer advised that general demand for office space in the Bakewell and Peak District area had declined substantially Report The report is from a Sheffield property surveyor s practice, which also operates in the Bakewell area. It looks at the demand and supply of office space and the investment market. The report is summarised below: 15 Demand for additional space: Levels of economic activity and the suitability of existing office buildings drive the demand for additional space. Decisions on accommodation are made on the following criteria: Business trends Anticipated employment trends Merger and acquisition or consolidation Locational preference Technological change in work practices Policy intervention including land use, car parking 16 Bakewell office market: 1. With certain exceptions, the distribution of types of employment within Bakewell is similar to a large commercial centre such as Sheffield. 2. The demand for offices within Bakewell: Derives from the demand/needs of the local community rather than the attractiveness of the town as an office location. Is heavily dependent upon locally generated and sub-regional demand. Is dominated by smaller, fewer, local organisations when compared with nearby towns. 3. Bakewell has a relatively small office based sector, which largely serves the local area. These are distributed between the town centre and business park offices. 4. The attractiveness of the town is also a constraint on further development. 4 Page 4 24 Yield for good quality investments are around 6.5-7%. The demand from investors is dependent on yields from other investment sectors and the tenant demand. This means when costs of construction and finances etc are taken into account without rents of 13sqft some of the new developments would not have occurred. 25 However, developers have to consider the level of occupier demand. Where the capital value does not have to be maintained, rentals may be less to reduce periods when offices are vacant. 26 Meeting occupier demands: The report states that the rate of development has ensured that the amount of quality office space coming onto the market is broadly in line with demand. There are a number of local developers who operate in this market to provide this accommodation. Without occupier demand, developers will seek alternative uses; and until empty offices are let and income producing, they are unlikely to continue with new office developments. 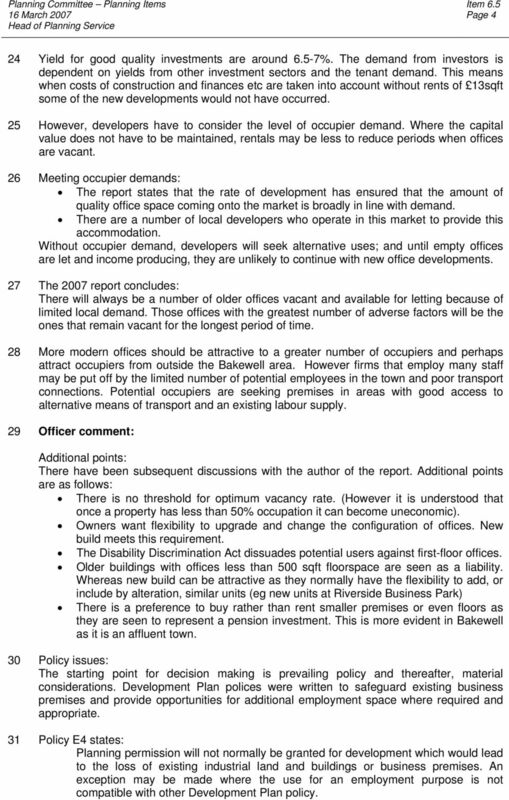 27 The 2007 report concludes: There will always be a number of older offices vacant and available for letting because of limited local demand. Those offices with the greatest number of adverse factors will be the ones that remain vacant for the longest period of time. 28 More modern offices should be attractive to a greater number of occupiers and perhaps attract occupiers from outside the Bakewell area. However firms that employ many staff may be put off by the limited number of potential employees in the town and poor transport connections. Potential occupiers are seeking premises in areas with good access to alternative means of transport and an existing labour supply. 29 Officer comment: Additional points: There have been subsequent discussions with the author of the report. Additional points are as follows: There is no threshold for optimum vacancy rate. (However it is understood that once a property has less than 50% occupation it can become uneconomic). Owners want flexibility to upgrade and change the configuration of offices. New build meets this requirement. The Disability Discrimination Act dissuades potential users against first-floor offices. Older buildings with offices less than 500 sqft floorspace are seen as a liability. Whereas new build can be attractive as they normally have the flexibility to add, or include by alteration, similar units (eg new units at Riverside Business Park) There is a preference to buy rather than rent smaller premises or even floors as they are seen to represent a pension investment. This is more evident in Bakewell as it is an affluent town. 30 Policy issues: The starting point for decision making is prevailing policy and thereafter, material considerations. Development Plan polices were written to safeguard existing business premises and provide opportunities for additional employment space where required and appropriate. 31 Policy E4 states: Planning permission will not normally be granted for development which would lead to the loss of existing industrial land and buildings or business premises. An exception may be made where the use for an employment purpose is not compatible with other Development Plan policy. A short guide to Enfranchisement and Lease Extension 1 2 Enfranchisement 3 contents Page 5 INTRODUCTION 7 THE COLLECTIVE RIGHT TO ENFRANCHISE WHAT IS IT? HOW DO I PREPARE FOR A CLAIM? HOW IS A CLAIM MADE? If the top up amount is below 1000 then we will make a grant if it is above this amount then you will need to apply for an Equity Release Loan. OFFICE RETENTION Date: 28 July 2015 CONTENTS 1: Aim of the document 2: Background Information 3: Current Context 4: Commercial Provision in Croydon 5: Demand 6: Permitted Development Rights 7: Future 1.